"Are you all right?" Holly asked from her apartment in California. "Well, I couldn't go to work," Suzette said. "I couldn't even fix Will and the kids breakfast, which didn't make him any less grouchy." Will, Suzette's husband, was abusive so Suzette was in danger of attack by night and day. We had been encouraging her to leave him, so far without success. "How about going to a doctor?" I suggested. "And tell him what?" Suzette responded. 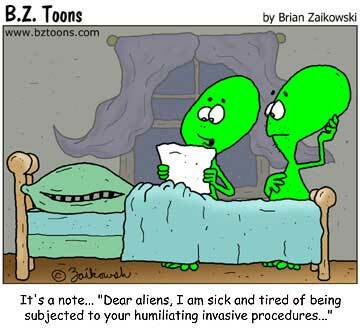 "That aliens dissected my knee and would he please reassemble it correctly?" "Don't tell him anything except that your knee is in pain. Let him figure it out." "No, I can't go to a doctor. He'll see the bruises on my back and report Will to the police." Suzette had two kinds of bruises: ones that Will inflicted that hurt, and ones left by the aliens that didn't. Whenever I felt overwhelmed by what was happening to me, I just reminded myself of the burdens Suzette had to bear and mine lifted somewhat. This was the part of the abduction experience that had been most publicized in 1990s books on the subject. First, readers and viewers were amazed by the missing time aspect; then, they were horrified by the fact that aliens were experimenting on our bodies. The fact that humans customarily experiment on the bodies of animals, often without anesthesia, didn't ever seem to be mentioned in these books. In 1993 it was still an open question of why non-humans were performing surgery on us. We experiment with animals to test cosmetics and medicines on them, but the justification is that their systems are somewhat similar to ours (and their lives worth less than our discomfort). Aliens would have no such justification. So, why? One of our newer abductees, Ann, reported her own medical issues. "I was having abdominal pains," she explained. "So my gynecologist sent me for an MRI. It turned up 'Unexplained Bright Spots'. That's what they called them! They have no idea what they are… so of course they have me scheduled for surgery next Tuesday." "You mean, cancer?" I asked. "No," Ann assured me. "Cancer, tumors, internal bleeding, pregnancy—anything 'normal' produces a characteristic pattern on the MRI that can be used as a diagnosis. These 'unexplained bright spots' don't correspond to anything. That's why they want to open me up, to see what's causing them." "And I suppose your abdominal pains started shortly after your last contact?" I reported my own annoying reminder of these "visits": I "dreamed" of aliens taking me out of my bed one night; when I awoke in the morning and looked in the mirror I found I had something embedded in my left eyelid. It was about the size of a B-B, and felt to be the same weight and consistency. There was no discomfort or redness; it was not a pimple. It was just a—a thing, with no explanation. "Well, that's attractive!" I said out loud, wryly, when I first saw it. I decided I would not put up with this one. I'd had some kind of jell injected into my ear lobes and just below the base of my skull; I'd had an incision made in my arm and blood samples taken from my fingers. I'd borne it all with pretty good grace if I do say so myself. But I was not going to tolerate a disfiguring lump in my eyelid, especially when I had just started dating after my divorce. It's tough enough to be a single fortysomething gay man without having weird eyelids. I called Gary, my doctor. "I have a skin tag or mole or something in my eyelid," I told him. "I want you to take it out." I had told him about the aliens but I saw no need in making this connection for him. If there was a metallic implant, as I suspected, he could give it to me after he removed it. In 1993 there had not, as far as I know, been any implants retrieved. Later, of course, there were many. But that early in the game we were still trying to prove there even was such a thing. Manchester was a small city and one of the things I liked about Gary was that I could get him, personally, on the phone (or run into him at the gym); and I could get appointments with him on short notice. I called on Monday; we made an appointment to have the B-B removed Wednesday morning. Meanwhile, I had been reading an unusual book about aliens by an author named Lyssa Royal. Called Preparing For Contact, it was a more-or-less channeled description of a number of aliens. Most of it didn't really resonate with me, but the cover intrigued me; and the part that mentioned an alien species called the Pleiadians caught my interest, so I kept the book on my desk and picked it up from time to time. Tuesday night we had our usual Abductee Support Group online meeting. "How did your surgery go?" Holly asked Ann as soon as both were online. "Didn't have it," Ann announced. "When I got there this morning, I asked my doctor to please do a second MRI just to be sure. This time there were no unexpected bright spots. So there was no need to do the surgery." "You must have been relieved," I typed. "I wasn't even surprised," Ann admitted. "I 'dreamed' I had a contact last night and they took something out through my vaginal passage. That's why I insisted on the second MRI." "Still can't walk. I'm using some crutches we had around the house. I went to work, though. It doesn't really hurt so much any more, but I can't move it. Something odd did happen, though." "This morning, when I was at work," Suzette typed, "I was on the phone and doodling on a pad of paper at the same time. When the call was over I looked at what I drew and it was a picture of the inside of my knee, the way it was supposed to look." I could feel Suzette shrug through her keyboard. "I guess I don't. But it looked like an anatomical drawing, and it showed the muscles and ligaments and cartilage and everything. And I got the impression that I had drawn the way my knee is supposed to be, with whatever the visitors did wrong, fixed." "Some research has been done using hypnosis to get people to diagnose their own illnesses," Holly supplied. "Maybe that's what you did." "Put the drawing under your pillow tonight," I suggested, only half kidding. "Maybe they'll take the hint." "Paul," Holly typed, "Grandmother is holding up two books." "Grandmother" was the name a wrinkled alien had told Holly to call it when Holly was five years old. Although that first meeting had been in person, Grandmother had continued to serve as Holly's "spirit guide," mutely passing messages directly to Holly's mind. Grandmother, who looked like a wrinkled version of the typical Whitley Strieber alien, couldn't talk, but used mime and props to get her messages across. "She wants you to read them." "The first, I've never seen before," Holly said. "But Grandmother definitely wants you to read it. It's Where Is Joe Merchant? by Jimmy Buffet. At least, that's what's on the cover. 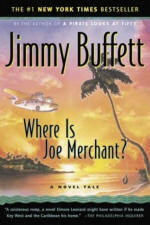 Does Jimmy Buffet write books?" "I've seen that one in the book stores," I replied. "I never got it because…well, Jimmy Buffet. But I'll pick up a copy." 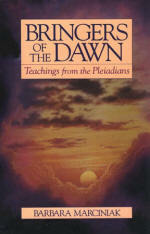 "The second one is Bringers of the Dawn by Barbara Marciniak. I bought a copy of that a couple of years ago but I've never read it; I didn't even know why I bought it. Now I do. I'll send it to you." "Why am I supposed to read these books?" I asked. There was a pause on the computer screen. "Grandmother says you are interested in the Pleiadians. These books will tell you what you wanted to know." I was nonplussed. "Jimmy Buffet knows about Pleiadians?" "I'm just telling you what Grandmother showed me." True to her word, Holly overnighted the book to me; and the next morning I awoke early to get ready for my inpatient surgery on my eyelid. Gary, my doctor, had warned it would leave a scar; I couldn't imagine any scar being worse than this lump. But as I looked in the mirror to shave, I discovered that the lump was gone. Without a trace. No scar, no reddening, nothing. It was as if it had never been there. I shrugged and called Gary to cancel. And that night I went online to tell anyone who might be there. Suzette and Holly were online. "Guess what happened to me?" I challenged. "Whatever it is, I've got it beat," Suzette claimed. "The visitors fixed my knee." "They fixed my eyelid," I countered. "Did your eyelid keep you from walking?" "No," I admitted. "Yours is better. Tell me what happened." "Well, I didn't put the drawing under my pillow. But I couldn't get that image out of my mind," Suzette continued. "I had another dream contact, more knee surgery, and when I got up this morning my knee was fine. No pain, no stiffness, nothing." A chill went down my spine, and I began to see those light-bending shadows flicker around me that seem to indicate I'm about to make a life-changing realization. My fingers flashed furiously across the keyboard. "Time out," I typed. "Let's list what we know. 1: When we yell at the aliens to leave us alone, or whatever, they ignore us. 2: Holly's Grandmother, the alien we have closest contact with, uses mime and imagery to communicate, never words. 3: When Ann and I had the intention of seeking medical removal of implants, the implants were removed the night before the procedure. 4: When Suzette went to sleep with an image in her mind, the aliens acted on it. 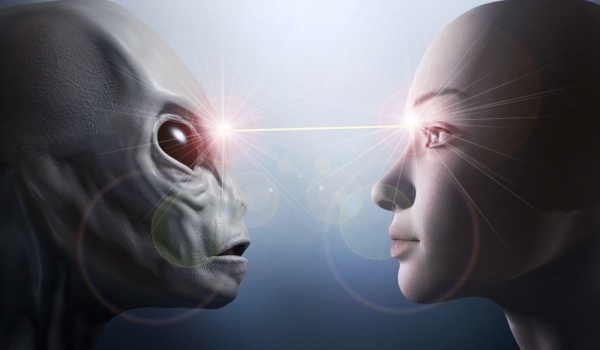 What if…the aliens aren't verbal? Maybe they don't speak to us…because they can't?" There was a pause. Then Holly typed, "Grandmother is nodding. She seems very pleased." "But if she doesn't know words, how does she know what Paul just typed?" Suzette asked. "I've learned through the years to create mental pictures for Grandmother," Holly offered. "We need to try to communicate with them using their language, the language of images," I suggested. 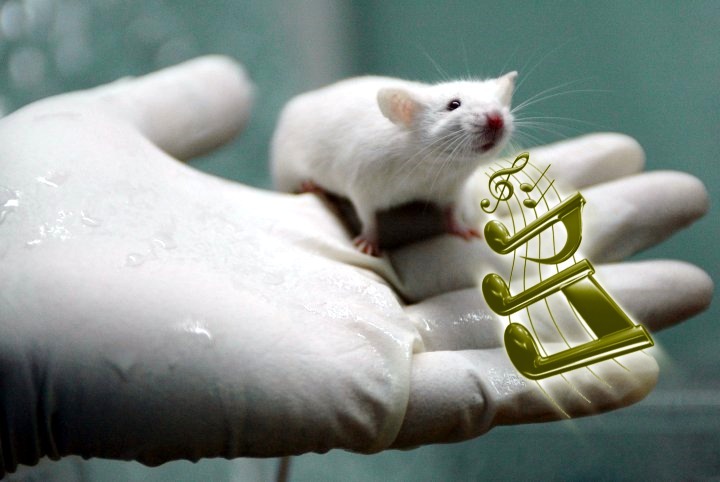 "We need to be the lab rats that whistle Dixie, to get the attention of the lab technicians." "But what's the image for that?" Suzette asked. "Any visual I can think of for communication, involves me talking or writing." 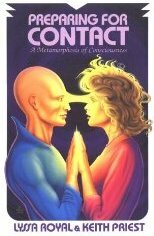 At that moment, my eye fell on the cover of Preparing For Contact. "Picture yourself eye-to-eye with an alien," I typed, "with a beam of light passing back and forth between your forehead and the alien's. Try to hold this image in your mind as you go to sleep tonight." …and awoke into what seemed like a vivid dream. I was in a small auditorium, much like the one in my old high school, St. Joseph Academy. On the stage were seated a row of aliens, wearing black gowns and mortarboard caps with tassels. An additional alien was standing, similarly attired. I rose from my seat in the front row of the audience, also wearing a graduation gown; walked up the steps to the stage, and received a rolled diploma from the alien, who then shook my hand—as I write this, I can still feel the oddness of his bony fingers as they grasped my hand, the two short ones fitting into my palm, the two long ones wrapped around my wrist. When I awoke in the morning, my left hand was still clutching an imaginary diploma, my right still feeling the touch of those inhuman fingers. On CompuServe, Suzette and Holly weren't online; but they had been and had left messages for me. Suzette had also "dreamed" of a high school graduation in which the staff were aliens; essentially her dream was identical to mine. Holly's graduation dream had been of a kindergarten graduation, taking place in a brightly-colored room with toys scattered about, and without the somber robes that were part of Suzette's and my experience. People often think of graduations as a terminal experience, the end of something. Yet, while our graduations did signify an end to most of the surgical and experimental procedures that had accompanied our abduction experiences, they were most definitely the beginning of a dramatic new turn in our contacts with the visitors.